Elder has an important place in traditional European peasant medicine. These days, we primarily use the flowers and dried or processed berries of the Elder plant, as the leaves, bark and raw berries are mildly toxic. This week, the flowers are in full bloom and if left on the plant, will become berries later this summer. Elder flowers contain volatile oils, coumarins, bitters, flavonoids, sterols, mucilage and tannin. They are cooling, immune-building, slightly blood thinning, soothing, mildly stimulating (but not very warming) and slightly tonic as an alterative and astringent (Matthew Wood). Elder flowers are often used for their ability to help ease upper respiratory congestion, in particular for hay fever and sinusitis. They are also helpful in treating colds and the flu. The fresh flowers are a stimulating diaphoretic, bringing blood to the surface of the body and strengthening the periphery. When dried, the flowers have a more sedative diaphoretic quality and reduce heat, open pores and disperse the blood. The flowers can be used fresh or dried for use as an infusion or tinctured. Elder flower infusions are helpful with fevers. To make an infusion, pour 1 cup boiling water over 2 tsp dried flower or 4 tsp fresh and steep for ten minutes. Drink hot three times a day. For a fever reducing tea, try a combination of elder flower, peppermint, yarrow, ginger and lemon. Edible flowers are edible, dip them in a light batter and fry, serve with elderberry jam. Pack the flowers into a jar and cover with apple cider vinegar. Cover the jar, set aside overnight (or for longer), then strain through a cheesecloth. Gargle the vinegar for sore throats. Bring 2 cups of water to boil and add 3/4 – 1 cup fresh elder flowers. Cover and let sit overnight. Simmer for twenty minutes, then strain the mixture and pour into a clean jar. Add 1/2 cup of honey and shake well. Allow to cool and store in the fridge. Take a spoonful for a sore throat or cough. When the elders are in full bloom their sweet soothing scent wafts through their chosen fields and meadows. They can often be found bordering streams, brooks, and the lower, wetter places in the landscape. It is in late June early July when their white blossoms rise like delicate crowns above their leaves that they stand out the most. One of our favorite weekend morning treats this time of year is fresh elderflower fritters. 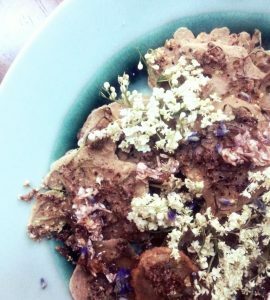 They make a delightful floral pancake, and are no harder to whip up than ordinary pancakes, once you’ve harvested the elder blossoms that is! In a medium bowl mix together dry ingredients. Add in the remaining ingredients and whisk until combined. Heat butter or oil in a cast iron or griddle over medium heat. 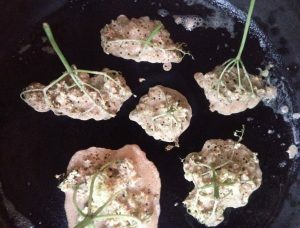 For a lacier fritter use more oil – 1/4 or so in the bottom of pan. Holding elderflowers by the stem, dip them into the batter and place on hot pan, shaking them out a little bit to spread the flowers. Do this one by one until the pan is filled. Fry for a couple of minutes each, until bubbles rise through and the batter looks fully cooked. After you’ve removed the fritters from the pan snip off the green stems, they’re unpleasant to eat and may cause stomach upset. Garnish with maple syrup, herb infused honey, and fresh flowers! Cautions/Contraindications: Black Elder (Sambucus nigra) and Canadian Elder (Sambucus canadensis) can be used interchangeably however Red Elder (Sambucus racemosa), which grows in uplands in North America, is highly toxic so be especially careful when identifying the tree. Elder flowers are the safest part of the plant while the berries must be dried or heated before use. Fresh berries eaten in quantity may be toxic.